Farmers hate the sight of circling buzzards in the sky. Their black merry-go-round usually signals an animal is in distress. On my dad’s dairy farm, it meant a cow was down. We’d seen the buzzards and went searching. In the late morning we found the cow lying down in a back corner of a field. Her sides caved with each shallow breath. She shivered and grunted. The calf inside her was stuck. Daddy went to his truck and gathered the tools and ropes needed to help her. As he worked, I watched the buzzards flying overhead, dipping closer with each rotation. An hour passed before Daddy pulled the calf into the world. Within minutes, the young bull stood on shaky legs and walked to his mother. He touched his pink nose against her flank and called to her with his baby-wail. Her ears flickered. Her breaths still whooshed like a steam engine’s chugging. The cow sat up, then tried to stand, but her legs crumpled beneath her and she belly-flopped onto the ground. She stared ahead, eyes wide, gasping. The buzzards landed nearby. They folded their wings to their sides, congregated together and took a collective step toward the cow. Daddy waved his arms then clapped loudly as he bellowed at the feathered intruders. The buzzards squawked, hopped a few feet away. “We’ll give her another minute. If she can’t get up, we’ll take the calf to the barn. I’ll come back for her by myself.” I knew what those words meant. Daddy would have to end her misery, and he didn’t want me to watch. “Come on Mama. Get up.” I whispered to myself. The calf released a high pitched cry, and staggered close to his mother’s head. She drew a deep, grunting breath and rolled onto her stomach. After a few failed attempts, she struggled to her feet, swayed, then righted herself. She swung her head and called to her calf with a soft, low-pitched note. As her calf nursed, she licked the afterbirth from his fur. 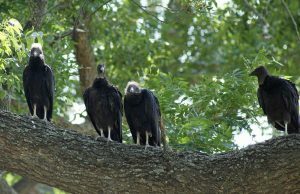 And the buzzards? They flexed their wings and flew away. We herded the cow and her calf toward the barn. The way was long. Her steps were stiff and slow. She stopped often, sucked in shallow breaths, then gave a soft “moo” to her calf to follow as she continued on. When we reached the barn, Mama shuffled into the empty pen and crumpled on the bed of hay Daddy spread for her. She lay her head down, taking little notice of anything around her as she looked ahead glassy-eyed. “Is she dead?” I asked as I watched her baby lie down and snuggle against her. Daddy shook his head. “She’s still breathing. It’s all up to her now. She decides if she wants to live or not. We’ll let her rest.” We filled a bucket with fresh water for her and left the barn. Late in the day, we came to check on her. She sat on her belly, and looked at us as we watched her chew the few strands of hay hanging from her mouth. Her calf stood nearby, his belly bulging from a recent meal. Mama had made her choice. No matter how terrible things looked in the moment, no matter how many buzzards circled above waiting to make her their next meal, she had to get back up on her feet. Life’s difficult challenges often circle over our heads. Divorce, errant children, illness, aging parents, and financial struggles bring tremendous pain. They sap our strength and we find ourselves crippled by despair, without any hope of getting up. When the buzzards of life are circling you, remember Mama. Take steps to help yourself get off the ground. Reach out for help. Talk to someone who will encourage, advise and aid you. Rest. Take time to breathe, rejuvenate your spirit and build back your strength. Then, get back up, Friend. We need you. Praying you have a great week. Leave a comment, I’d love to hear your thoughts.